Receive a complimentary Exam or Teeth Whitening when you Complete a New Patient Exam, X-Rays and Cleaning. Infants should be seen by our office after the first six months of age, and at least by the child's first birthday. Botulinum toxin A (BTX-A) is one of many types of neurotoxins produced by the naturally occurring bacteria, Clostridium botulinum. "My 16 year old son came home from his appointment raving about his experience. I was a little worried since this would be his first time going without me to get him checked in, etc. He said how ‘awesome’ everyone was and that it was nice and that he felt they were really interested in what he was saying. We’ve had nothing but great experiences here!" "A great dental experience! I have had several procedures at the Bailey Dental office. The Drs and staff are so empathetic and professional. I am always satisfied with my cleanings, crowns, etc. I highly recommend this modern dental office." "Everyone at Bailey Family Dental are super nice,and make you feel very comfortable!! I have very high anxiety when I have to have any dental work done but this dental place always takes that anxiety I feel away!!" "I absolutely love this dental practice! The time and patience and care that Dr. Therese displayed while doing work on my 7 year old son was simply amazing. I would recommend anyone needing a dentist to go to Bailey Family Dental. I also love the fact that their equipment is modern. They are great!" "While playing sports, I managed to run face first into a pole. The impact managed to chip off over half of my incisor. The day of the injury Dr. Bailey was able to rebuild the missing half of my tooth. A year later, when it became clear that I would need a root canal on that same tooth, I was a bit nervous. My father went to dental school, so I knew a bit of what that entailed. My fears were pointless. The procedure was quick and painless, and my tooth now feels much better." "Love the Bailey family dental team. From the moment I entered the office the atmosphere is truly one of a kind. The added touches of soft music, movies and warm blankets only add to the genuine care and concern the staff offers. The multitude of services from teeth cleaning to dentures was surprising. I highly recommend Bailey family dental for all ages and concerns." 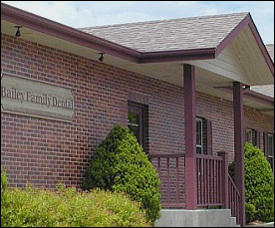 "Bailey Family Dental is a friendly, professional group who do fantastic work! I would recommend them to all my friends and family!!!" "I had a toothache and called my dentist who advertises 24 hr emergency service in Delafield. It was 12 noon Thursday and I was told that they are closing in a half hour, are not open on Friday and had no appointments on Monday. I called Bailey Family Dental and even so they had no appointments available said I could come in right away. The office staff was wonderful. They were so helpful and the Dentist was super nice. He made me feel welcome and took care of my toothache. Needless to say that this will be my new Dentist." "Great dentist office. Dr. Bailey makes sure all of her patients are comfortable. The office lets the kids pick out a movie to watch during treatment so they worry a little less. I wouldn't trust anyone else with my family's oral care. Thanks!!!" "The staff at Bailey Family Dental make going to the dentist enjoyable! The spa-like atmosphere immediately puts you at ease. The front desk staff is welcoming and helpful. The dental hygienist that cleaned my teeth, I believe her name was Pang, was gentle and made me feel comfortable the entire visit. Dr. Bailey was friendly and after examining my teeth, was able to prioritize a treatment plan for me so that I could schedule necessary dental work at my own pace according to my budget. Overall a great experience!" "A very positive experience with both the staff and the doctors/assistants! The office folks are very friendly and professional. The doctors/assistants are thorough and caring. I would recommend the Bailey’s experience to everyone!" "I was greeted by smiling faces and I checked in with the new paperless system. I was offered complimentary comfort amenities to make my dental experience more relaxing. I used the warm neck wrap and hand treatment, and both were wonderful! Lydia cleaned my teeth gently and thoroughly, and afterwards, Jenny assisted Dr. Terese Bailey during my implant crown appointment. The two of them worked together seamlessly and asked questions to make sure I'd be happy with the end result. I highly recommend Bailey Family Dental & can assure that the discriminating patient will be pleased with the experience." "Having gone through multiple dental procedures over the years, I have found both Dr Terese and Dr Richard Bailey, as well as their staff members, to be very kind and caring professionals with top notch skills. Bailey Family Dental also provides an unusually warm and welcoming office, which helps make "going to the dentist" an overall pleasant experience. I highly recommend them to anyone seeking high quality dental care delivered in a high quality environment." "We have been going to Bailey’s since 2014. My children loves the place so much that they would ask me when is their next dental appointment 😊. Lovely environment, staff and fun complementary add ones such as a heated neck pad and a hand parafin treatment." "I haven't been to a dentist in 10yr. I can't say enough about the Bailey Family Dental staff. They are the greatest. Lydia is my hygienist and is wonderful and no pain. Dr Bailey is great, caring and through. Thank you all for being there"
"Without question, fantastic family dental care! We recommend Bailey family Dental to everyone we know. As a retired military family, we have had numerous Dentists all over the country over the last 30 years or so. By far the best!! Thank you all so much. I have two younger children who are a bit “ nervous” about dental work usually. Not here! The extra care and consideration immediately puts them at ease." "I’m a new patient and I absolutely love this dental practice! Everyone is extremely nice and friendly! The warm neck wrap, hot oil hand treatment and skilled hands of my hygienist Breanna made my cleaning enjoyable. Not sure I’ve left a cleaning appointment feeling that relaxed! Dr. Bailey knows his patients and is excellent as well. Highly recommend!" "Bailey dental is the best!!! Everyone is so sweet & caring....from the moment you enter sweet Jenny takes care of you!!! Also love Roxanne ....makes sure you are comfortable at all times !!!! I used to have extreme dental phobia and now I have none!! Dr Richard is very knowledgeable & very calming!!! "Dr. Bailey is awesome! Very thorough and caring. Hygienist is great too😊 Very friendly staff. Definitely recommend." "As an older adult, I have had the opportunity to visit many different dental offices over the years...some good, some not so good. In comparison, I can definitely say that my experiences over the past 10 years with Bailey Family Dental have been overwhelmingly positive. Expert dental care, a warm and friendly staff, a comfortable and welcoming environment... all contribute to giving BFD an A+ rating in my book." "I used to dislike going to the dentist until I found Dr. Bailey and his team! They truly care for their patients and want the experience to be as pleasant and enjoyable as possible. It’s more like going to a spa than a dentists office, yet I know I’m still receiving exceptional care. Everyone that works there is super welcoming & friendly and they really know how to make their patients valued & appreciated." "Highly recommend Bailey's. After 12 years of worrying and terrified to address my worsening dental problems I am so happy to have found them to help me save my teeth. I wish I wouldn't have waited but maybe that's why I found such a wonderful, kind and reassuring dental practice. Just had my cleaning and first crown and couldn't feel more relieved, it all went so well. And they offer coupons and specials and sedation dentistry which I needed. Everyone at Bailey's is so nice and offer anything and everything to make you feel better. I couldn't recommend anyone more highly. Thank you SO much!" Hartland, Pewaukee, Oconomowoc , and Waukesha, WI . From the moment you walk in the door, you’ll be welcomed by a caring staff in a relaxed, stress-free environment where the whole family c an feel at ease. You will find at Bailey Family Dental, Drs. Terese and Richard Bailey, husband and wife team, are committed to your individual attention and strive to provide personalized oral health care tailored to your unique dental needs and goals. Your health and comfort are our top priorities. Whether you are looking for information on general dentistry, dental emergencies , teeth whitening, crowns , children’s dentistry , preventive care , or Botox , you can learn more about all of your options from our services page. Feel free to contact our Hartland office with any questions. We look forward to making each visit to our office a positive experience. Dr. Bailey pays your interest up to 12 months!!! !